4. 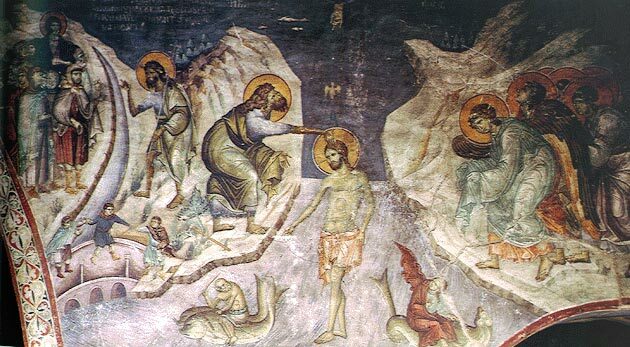 The fourth was that of John, being preliminary and leading those who were baptized to repentance, that they might believe in Christ: "I, indeed," he said, "baptize you with water; but He that comes after me, He will baptize you in the Holy Spirit and in fire" (Matthew 3:11). Thus John's purification with water was preliminary to receiving the Spirit. 5. The fifth was the baptism of our Lord, whereby He Himself was baptized. Now He is baptized not as Himself requiring purification but as making my purification His own, that He may break the heads of the dragons on the water, that He may wash away sin and bury all of the old Adam in water, that He may sanctify the Baptist, that He may fulfill the Law, that He may reveal the mystery of the Trinity, that He may become the type and example to us of baptism. But we, too, are baptized in the perfect baptism of our Lord, the baptism by water and the Spirit. 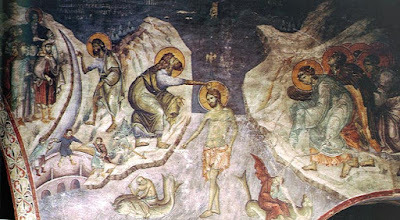 Moreover, Christ is said to baptize with fire, because in the form of flaming tongues He poured forth on His holy disciples the grace of the Spirit, as the Lord Himself says, "John truly baptized with water, but you shall be baptized with the Holy Spirit and with fire, not many days hence" (Acts 1:5), or else it is because of the baptism of future fire wherewith we are to be chastised. 6. The sixth is that by repentance and tears, which baptism is truly grievous. 7. The seventh is baptism by blood and martyrdom, which baptism Christ Himself underwent on our behalf (Luke 12:50), He Who was too august and blessed to be defiled with any later stains. 8. The eighth is the last, which is not saving, but which destroys evil, for evil and sin no longer have sway, yet it punishes without end. Source: From An Exposition of the Orthodox Faith (Bk. 4, Ch. 9).